Packet Analyser is a powerful diagnostic and reporting tool to proactively manage Users, devices and call quality on the VanillaIP platform, which in turn enables faster response and fix times on tickets. This is a major customer service enhancement, Uboss PA is a new module being added to what is already a very powerful portal. All new and existing Businesses and User are automatically allocated Uboss PA, by using logical name searches allows for quick drill down, whether looking across the whole base or down to a single user, Uboss PA delivers the detail that is required. 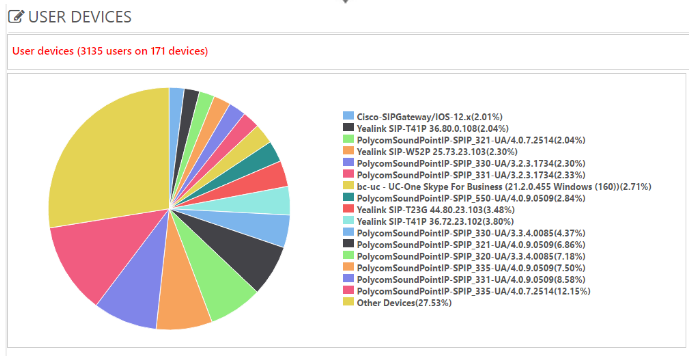 Call Analysis – Call Graph provides summary visibility of all calls for the resellers customers. Use the duration buttons to toggle the view for the last week, month or as required. Custom Alerts – Custom alerts are configurable email rules that notify you when monitored events occur, such as when one of your customers activates user initiated Trace. Optionally you can also trigger alerts against event Codes, as listed in the Active and Historic Calls tabs. For example you could set an email alert every time a call is listed as “403 unauthorized”. Device Registrations – Registrations shows every device connected by the resellers customers, but can also display attempted registrations, as a real-time of a period view going back up to 14 days. The user devices pie charge will show all the device types that are registered. Toggle specific devices on and off by clicking their name. the table on the right hand column breaks this down in greater detail by listing every firmware version of every device and the number of each that are currently registered.